What is the most abused part of your body? Look down, way down to the bottom of your legs. If you stumbled upon your feet, you are right. We expect our feet to carry us through thick and thin, from high intensive sports to gentle waling about while carrying your mass above them. We also expect our feet to be there for using anything we want to do. So, let’s take care of them? Fit, support and comfort are three important characteristics of a god fitting ski boot. This means that ski boot design must compromise somewhat to accommodate the majority of feet out there. No two boot manufactures fit exactly the same shape of foot, so be prepared to try on different makes and models. 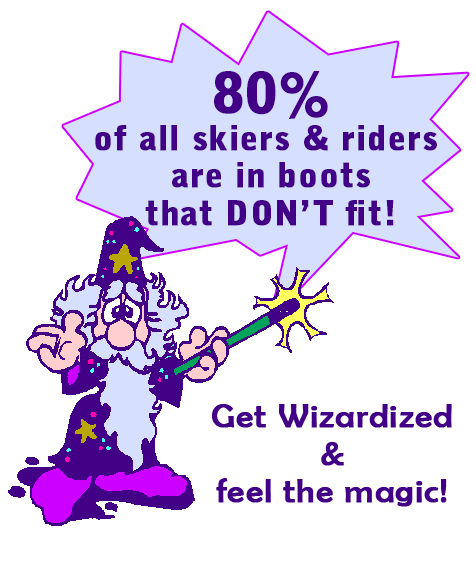 Whether you are male or female, there is a ski boot out there that will initially fit your fee. Now let’s talk about what it takes to get the best fit. Do you have long toes, short stubby toes, one toe that is longer than the rest, high insteps, low insteps, bony ankles, protruding bones or bumps, skinny calves, thick calves, bunion, or bone spurs? Feet are as variable and unique as the rest of the human anatomy. If you presently own your boots, try to remember the fit problem you may have had from last season. If you can’t remember, put your boots on and make a mental note of what’s happening or write it down. The more information you can provide to the boot fitter of your choice the better job they can do for you. I f you decide to keep your present ski boots, a good boot fitter can make the necessary adjustments to your boots so that they perform better and are more comfortable. The first thing to decide is what your ability is now and where you want to go in your ability over the next five seasons. Once you have that in mind, the next thing to consider is the type of boot you need. The choices are numerous and sometimes confusing. Ask your skiing partners how their boots fit and where they got them. The may be able to recommend a reputable boot fitter to you, but remember, just because they ski with brand X does not mean you will be skiing with brand X on your feet. Find a specialty ski shop or sporting goods store and going in prepare to spend at least one hour to explore the different models and what they will do for you. It may sound strange but one of the most important pieces of the fitting equation is the sock. 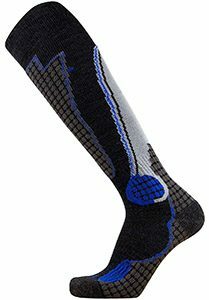 Not only is it part of your equipment but also it should be a quality SKI SOCK specially designed to help keep the foot dryer and warmer than the conventional cotton tube sock. A ski sock provides a close smooth wrapping of the foot along with comfort. They tend to wrinkle less and move perspiration of the foot *sweating) away from the foot to reduce the tendency of cold feet. High tech fibers, both natural and synthetic, are interwoven to provide a quality ski sock. They cost a little more but are worth the money. When fitting boots begin with a number of models in the appropriate shell size (with the help of your boot fitter). Now, let’s take the boot apart. Remove the liner and the manufacturer’s insole. Place the insole on the bottom of your foot, checking where your foot will sit on it. Allow from ¼ to ¾ of an inch of the insole to be showing, depending on the length of your toes. Next, place your foot in the liner gently, pulling your heel back in the line. Feel around the outside of the liner from the heel to the toes. Be aware how close the liner is and that, when the liner is in the shell, it could be closer yet. While liner is still out of the shell, place your foot in the shell, gently moving your foot (the larger of the two) to the front of the shell, stand up pushing your knee forward. Now look into the shell at the back of the heel and the heel cup of the shell, noting how much space you have between both (it should not exceed more than ¾). Remove your foot and replace the insole and l inner in the shell. Remember you have two feet so check both. Put the boots on, buckles done up just enough to close the shell and drive your knee forward 2 to 4 times to set the heel in the heel pocket. Re-buckle to hold the foot, not to crush it. This may feel like a close fit to the extreme of claustrophobia of the foot. Patience now! Spend anywhere from five to fifteen minutes in the boots working your knees forward, and on the inside and outside edges, as if you were skiing. Remove the boots giving your feet a rest. Remove the ski socks, looking for pink areas, red areas, (different shades) that will tell you where the boot is holding the foot and where it is not. Also, be aware of any circulation problems, cramping, and other aches and pains. The different densities of foam material in the ski boot liner will move at different rates depending on the heat of the foot and the amount of pressure against it. Time will tell. The more time you put into it the better a fit you will get. Here’s the challenge… should you put these boots back on? If you are adventurous say Yes. What you will probably find the second time you put these boots on is that you have more room in the boots than before. Give it some more time working the boost for another five to fifteen minutes. And you thought this was going to be easy! A ski boot should fit like a good handshake all over the foot without cutting the circulation off, cramping or the pain of individual pressure points. With some work, supportive foot beds, shell expansion, moving buckles, or shell material being removed can eliminate most of your concerns. A trained boot fitter can perform all of these options. Remember nothing is instant. It may take some time to make everything work for you. If you are purchasing new boots, ask about the shop boot fit warranty. A good boot fitter is worth his sale. He can provide you with a number of options to make your present or new boots fit better and perform better. All of these options are an additional expense so be prepared to spend some money on quality work. A good technician/boot fitter is likened to a good mechanic, when you find one that does quality work stick with them. Your feet will thank you at the end of a great ski day.